"How did that happen??! Wait, didn't you just get back from Haiti?" Given that it was the most frequently asked question I've heard in the past few weeks, that is what I shared first about my impending mission trip to India, in this post. The second most frequent questions were "What will you be doing there? Who are you working with this time? Is this another independent trip?" As many of you know, my heart breaks for the vulnerable people of the world, those living in extreme poverty, especially when it brings about increased risk of human trafficking, slavery and abuse. This passion is born from personal experience, and it runs to the depths of my soul through God's redemption of my life. 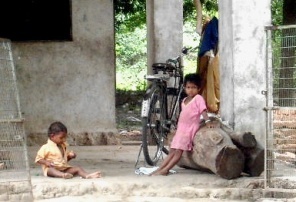 India has the dubious reputation for being 2nd in the world for children suffering from malnutrition, which stems from a critically high number of children living in abject poverty. Girls have little value in India, often ending up trafficked, sold into marriage, forced begging, or worse. Boys are not spared either. That is, if these boys or girls even reach past the age of 5. In the time it has taken for you to read this post up to this point, four children under the age of 5 died in India from preventable causes. Lack of clean water. Malnutrition. Malaria. Cholera. Pneumonia. Diarrhea. This continues, around the clock, every single day, every week, every month, year round, seemingly unstoppable like the ocean waves that continue to crash on the world's shores... Except for one difference: While we can't hold back the ocean from crashing ashore, we CAN turn back the tide of poverty. One child at a time. And the tide IS being turned back... extreme poverty is being served an eviction notice like never before. One by one, people are being empowered against poverty, and the chains of injustice are being broken. His Hands Ministries works in India through the local church to support their outreach programs that serve the most vulnerable children within the local communities. Through the ministry and the local church, children's basic need for food and education are being met, and through education, the stronghold of poverty is loosened and these children's risk of human trafficking, slavery, and other heartbreaking practices is significantly reduced. Children are holistically empowered and are led to the skills and abilities needed in order to gain employment, and as such, the generational poverty cycle breaks. Every minute we wait equates the lives of four more children. The harvest is plenty, the workers are needed, the call is on my heart to go... the time is now. For more information on His Hands Ministries, please visit their website here. Your financial support would be a blessing, not only to our lives and spiritual growth, but most of all to His people in India. Please consider helping me with the travel costs by using the Paypal button on the upper right hand sidebar. Children from the His Hands program are also available for sponsorship through His Hands Ministries here. And with your help... this minute... a child will live. Join us in prayer, let our light rise for Him in unison as we live out Isaiah 58, together. In November of 2011, days before we were set to leave for Ghana, I received the news that I would be joining a mission team in Cameroon the following February. Having used all my vacation time for Ghana, and having very little time to fundraise the necessary travel costs, saying yes was still an easy act of faith. In November of 2012, days before we were set to leave for Haiti, I received the news that I would be joining a mission team in India the following February. Having used all my vacation time for Haiti, and having much less time to fundraise the necessary travel costs, I wanted my yes to be just as simple, but it required more prayer and consideration. I'll be honest, when my spiritual leader and role model, one of God's amazing disciples, Jamie Charles, reached out and extended the invitation to join her as she leads this trip, I wanted nothing more than to say yes at any cost. The opportunity to join His Hands Ministries in India is overwhelmingly great, both in terms of the blessing to serve Him and His people there, but also in terms of spiritual and personal growth. That being said, to some, I had every reason to say no. It's no secret that it's been a tough year. Some would say that alone makes it the wrong time to be doing another mission trip, so close on the heels of the Haiti trip and all the changes here at home. Few would say all the more reason to go now, even though serving, spending of ourselves to save the life of someone else, brings healing and restoration to the spirit. Most would say the cost was too high, the time not right, that I had "too much on the go", "too much on my hands", that I needed a break, that I needed to be there for my kids. While I understood their concern, what I really wanted to know was God's perspective, not ours. I don't want what the world offers, I don't want easy or comfortable, I want what He wants. "Father, I have this blessed opportunity in front of me to serve Your people in India, but I do not know if I am the best person for Your work there... if You can really use me right now, as I am, with the present circumstances. I need to know Your heart on this..."
I sensed God asking me why I felt this way, why I felt He might not send me... I answered: "Daddy, there seem to be so many reasons I should not go... My marriage has ended, I am on my own. People will tell me I should stay home and take care of my family. I only have one income now, I have to be very careful with my financial resources, I need to protect my ability to sponsor these 17 children I have committed to, and to provide for mine as well. I do not have vacation time from my work so that I can take the time to go, this means that I would not be paid for my time while I travel. I am trying to prepare the house to sell, it is a lot of work and I have so little time left for much else. I am tired, and worn, and although I greatly desire to go, I do not want to hinder Your Kingdom by being the weakest person for You to send." His response was yet another question, asking me how I felt He would respond to these reasons... and it came to me swiftly and strongly -- "Father, You would remind me that although my marriage has ended, I am not on my own, I am never alone for You are with me always... and You have provided me with people who support and love me and are by my side... You are the one Who takes care of my family when I serve You first. You would also remind me that my income is limited, but Your provisions are endless, and all that I have comes from You and belongs to You. You'd also point out that You have protected my ability to provide for the sponsorships and for my children for the past two years while reduced to practically one income. You would tell me that You created time and Your provisions are endless, and that You provided for the same circumstances last February when I was in Cameroon, and it's certainly within Your power to do it again. You would probably laugh at me and remind me that the house will sell in Your time, not mine, and ask my why I do not simply let You take care of that and not be concerned? And last but not least, You would remind me that You often choose the weak, the most unexpected, the worn, the old, the tired, the ones the world would not send... You came to earth for the sick, the poor, the lonely, the orphans, the widows -- You promised that in our weaknesses, You are made strong, Lord, and as such, I should not question Your reasons for sending me, that perhaps it is not only to serve others, but so that I may grow in You, or lead by example for someone here... I don't know Your purposes and plans, Lord, but I trust You... Yes, I may be weak in the eyes of the world, but You equip the called and I hear Your call on my heart. I am willing, and that is my answer... I am willing. May it be done as You have planned." I gave my answer to the trip leader, and told her that should all the pieces fit and the Lord be willing, she could proceed and book my ticket while I was in Haiti. I would learn upon my return whether or not I would be going to India. Either way, I would accept His answer. When I returned, God had answered... my tickets were booked. If you are familiar with how the fundraising went for our mission work in Ghana, you will remember that I compared it to Nehemiah, who had been given the task to rebuild Jerusalem's walls in 52 days. It seemed impossible. The same was true of our fundraising efforts. We needed to raise $30,000 by November of 2011... we started in March of 2011, and by September of 2011, we were at 12%. How would God do it? We trusted explicitly that He would. With less than 53 days to go, He provided, all of it, in full, as well as our own travel costs. All it took was faith in a God that could, and would. That's what it will take this time too, in abundance. I have until Monday, December 17th to pay my airfare to India. $1563. A mere six days. I have until February to raise the in-country travel costs ($500). Seems so little in light of the $30,000 we raised for Ghana, or the $3300 we raised for Haiti... but on a human level, it seems just as impossible. The amount has never, ever been the issue. Whether $30,000 or $3300, or $1563, it always comes down to the fact that I come to the table with empty hands, only able to spend of myself, pour out my life as an offering, but coming short of the miracle it will take. I have nothing to offer but absolute faith in the God I serve. Nehemiah built the walls in 52 days. That might just be why God picks me time and time again -- He delights in doing the seemingly impossible through the least likely. If you would like to sow seeds into this miracle in the making, into this ministry, donations can be made by Paypal (link on sidebar or jd@beyondmeasure.me) or in person, through online banking (Canada) in any amount, no amount too small, as our God multiplies the blessings. Your support is a blessing, not only to the people we will serve in India, but to people whose lives I touch here back home, and to my spiritual growth too.